I have been playing around lately with blended nuts and seeds as a base for creamy dips and dressings – sunflower seeds blended into dips, cashews blended into a cheesey filling for stuffed zucchini flowers. Using nuts and seeds not only adds depth and flavour, it also provides added nutrients to the dish. I decided to change it around a little and use blended cashews in place of sour cream for the horseradish sauce. Originally I thought I would just use zucchini pasta as I envisioned the sauce being quite heavy, but the end product was actually quite light (plus I was quite hungry!) so I used a combination of spiralised zucchini and wholewheat pasta. The end result was amazing, horseradish and salmon compliment each other beautifully and if you’re a fan of either I strongly suggest you give this dish a go. *Also, if you haven’t entered my competition to enter a copy of Julia Mueller’s amazing new cookbook Delicious Probiotic Drinks, there’s still time. Head over to my previous post here and leave me a comment for your chance to win. To make the cashew dressing, place the cashews in a bowl with 1 cup of water. Allow to sit for at least 6 hours, then add to a food processor with the other dressing ingredients and process until combined and creamy. Heat a large frypan over medium to high heat and add a little oil. Add the sliced zucchini and fry a few minutes on each side until golden brown. Meanwhile, cook the spaghetti according to packet directions. Add the zucchini noodles in the last minute of cooking, and then drain and allow to cool slightly. 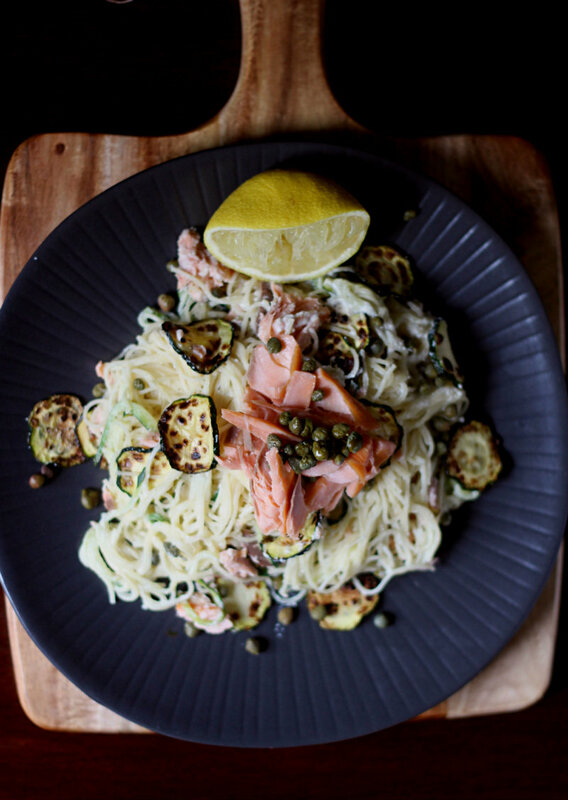 Add the pasta, fried zucchini, salmon and capers to a bowl and toss to combine. 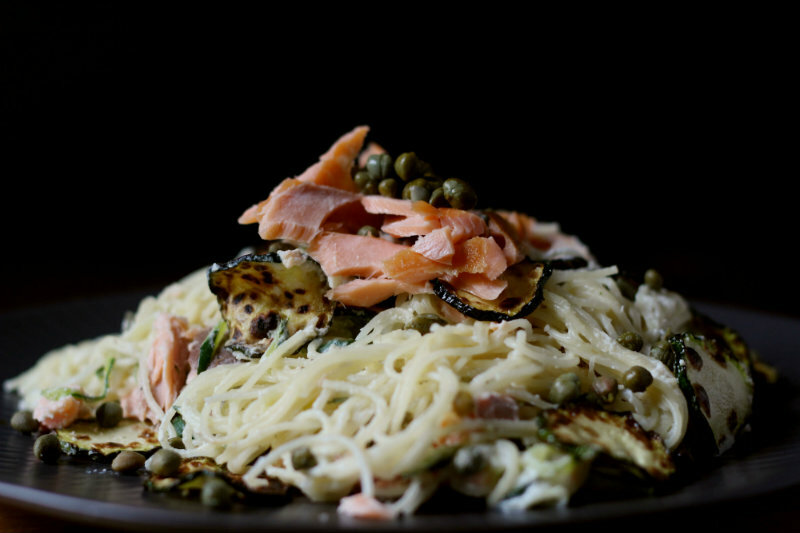 Stir through the dressing, and serve topped with extra capers and cracked black pepper. « Chocolate beetroot smoothie and the importance of good gut health + a giveaway! This looks DELICIOUS!!!! I love love LOVE salmon!! It’s so amazing!! And I just found your blog!! It is so lovely! :) I hope that you have a great weekend! It’s great adding nuts to recipes. I love the addition of cashews in this lovely dish. 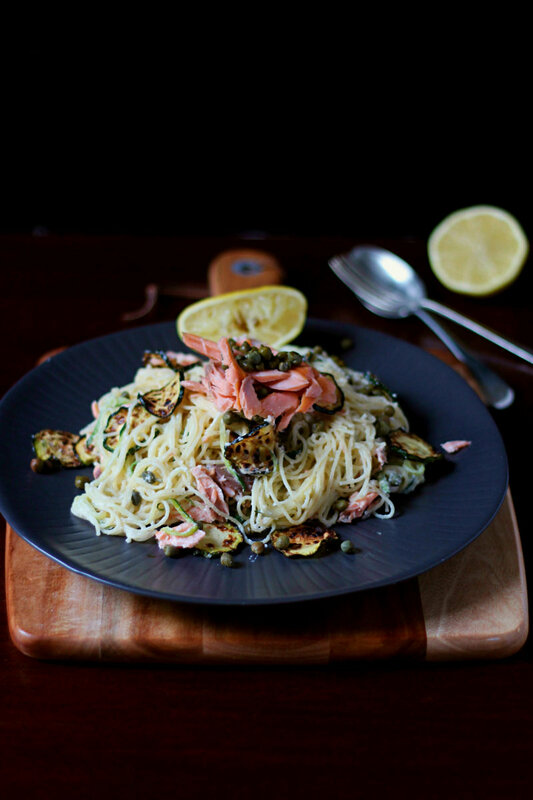 Zucchini noodles sound so delicious and light and healthy. I’ve been wanting to make it for a long time, but don’t really know how to. How to you make them? This looks amazing! Great photos. :) I love horseradish and what a great idea to add it to a pasta sauce. I’m really looking forward to trying this one! 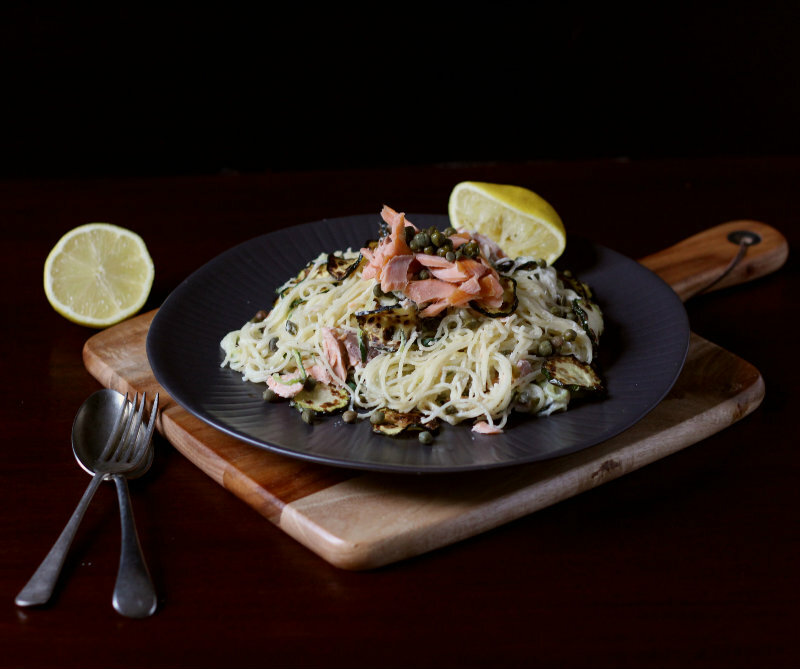 Just need a spiralizer … Thanks for the recipe! Such beautiful photographs! And the pasta sounds so yummy! I love love love salmon + horseradish together, so I defintiely need to give this a go. It sounds so delicious! Also, your pictures are absolutely gorgeous – I love the lighting! Wow – this looks amazing! I love fresh, light dishes like this. Pinned! I bought my first ever horseradish root today, and would like to use it in this recipe; but it being almost winter in my half of the globe, zucchinis are no longer in season. I keep wracking my brain what might be a good substitute for it here (I simply insist on including veggies! ), but nothing really rings like a good match. Can you help with ideas? Thanks!